The North Marion volleyball season came to a close on Saturday after the Huskies were eliminated from the playoffs in straight sets against the No. 2 Sweet Home Huskies. Despite winning a share of their league title, North Marion (15-8, 9-1 Tri-Valley) opened the state playoffs with a tough draw, facing a Sweet Home team (20-2, 12-0 Oregon West) that had won 10 consecutive games and lost only twice all season. 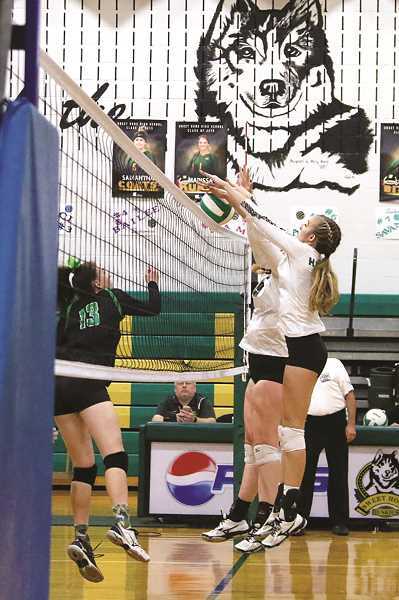 The Huskies were coming off back-to-back victories to win their first league title in nearly 30 years, but couldn't sustain the momentum after 10 days off, falling 3-0 (25-19, 25-12, 25-17) to Sweet Home in their first trip to the state playoffs since the OSAA reclassified to six classifications in 2006. North Marion bids farewell to its senior class that included captains Madeline Amezcua, Raymee Boese (Honorable Mention All-Conference), Emma Morcom (First Team All-Conference) and Paige Martin (Tri-Valley Player of the Year).